The popular Compass brand was around for 20 years before Elddis took it on in 1998. The marque rolled on for another 13 years when production finally ceased on all its ranges in late 2011, despite the fact that prototypes had been built. The brand was resurrected for the 2014 season, and two years on is back on track with two ranges – Corona and Rallye. On-the-road prices for the seven-model Rallye range start at £21,894, and its message of craftsmanship and opulence builds on a reputation for well-appointed models since the range’s inception in 1981. The six-berth 636 is aimed at families wanting a touch of luxury in a relatively lightweight twin-axle. The Compass is built using the SoLiD construction rolled out across all Elddis ranges a few years ago. The layout comprises offside fixed bunks, a rather smart end washroom, an offside double dinette, a nearside kitchen and a large front lounge. Many potential owners of this tourer will have a family unit of five; and we’re not sure whether the double dinette might have been better as a single, with the option of a bunk above for a sixth person, but Compass reckons this arrangement works well. Overall, the 636 looks very promising. And to see other Compass caravans for sale, click here. The Rallye rides on a twin-axle Al-Ko chassis with heavy-duty corner steadies, an AKS hitch stabiliser and ATC stability control for added peace of mind. Its one-piece sides are made from ‘Strong-Lite’ aluminium, and its awning rails are fully bonded. Aside from a gas barbecue point, an exterior mains socket and locker access, all service points are located on the offside. The large front gas-locker lid is supported by dual gas struts. Also fitted are a Thatcham Pro Active tracker, with one year’s free subscription, a Telco Teleplus directional aerial, and a 40-litre on-board water tank, with an auto-change water supply giving 80 litres of continuous water – ideal if you’re on a site with few facilities. New graphics complete the exterior’s smart appearance. The 2016 Compass Rallye 636 looks impressive. With six to provide for, the seating has to be good. And it is, in easy-clean Darcy Ozio upholstery with bolster cushions and four scatter cushions giving plenty of comfort. The bases have front flaps to access bedding easily without disturbing the seating cushions. Both sofas fall an inch short of 6ft, but there’s enough space for meal times. The central chest of drawers has a slide-out occasional table to accommodate tea and biscuits. Behind, on the front shelf, is a mains socket and USB point. Roof lockers line both sides of the lounge, while a shelf below the sunroof provides space for bits and bobs. A radio/CD player is concealed inside a locker, and speakers are placed on the locker sides to aid sound quality. Cabinet work is finished in elm with chrome detailing. The side dinette in the 636 offers ample seating for two or more and has a large window, plus overhead storage and LED corner spots. When catering for six you need a decent-sized kitchen – and the 636 doesn’t disappoint. Alongside the slightly dated-looking, large, granite-effect sink is good worktop space above a full-sized cupboard. Two mains sockets are placed high on the adjacent bulkhead. Space is helped by having a detachable drainer. Below the sink, which has a stylish chrome mixer tap, are three drawers and a locker, while among the roof lockers is a drinks cabinet with a glazed front. Equipment comprises a Dometic Series 8 155-litre fridge/freezer fitted next to the kitchen, with a microwave above; and the separate oven and grill is the latest Thetford Aspire 2 unit, with a dual-fuel hob – three gas burners and an electric hotplate – plus a glass lid and a glass side safety barrier. LED downlighters are fitted under the lockers, and striplighting below the worktop. 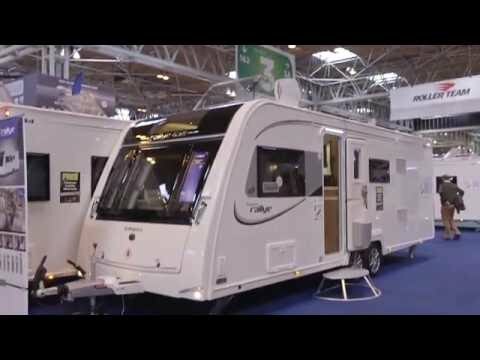 If you’re a family that likes to use small CL-type sites where facilities are limited, you’ll appreciate the Compass Rallye 636’s large end washroom. There’s enough floor space to supervise young children with washing and tooth-brushing, and to give you privacy for dressing. The wardrobe is located here, too. The loose-fit luxury carpet, fitted throughout the 636, is also present in the washroom, giving it a warm and cosy feel, which is accentuated by the chrome, heated towel rail. The shower cubicle is a fully moulded unit and comes with the EcoCamel shower head with integrated soap dish attached to the upriser. Above the rectangular basin is a large mirror and below the vanity unit is a cupboard for loo rolls, lotions and washbags. Above the Thetford electric flush swivel toilet a frosted window lets in daylight. Night lighting is courtesy of an LED ceiling unit. The 636 offers a couple of configurations for sleeping six people. There are the offside fixed bunk beds, which have good headroom and comfortable mattresses for both occupants. Each has a window and the top bunk is reached via a fixed alloy ladder. The seat bases of the side dinette can be pulled out from the side to transform it into a double bed. By pulling out slats from the centre chest and rearranging the cushions, the front lounge converts into a 2.03 x 1.43m double – alternatively, if the occupants are under six feet tall, the sofas can be used as singles. For a family of five, the side dinette double could be used by a teenager. Whoever uses it will be warm because there are vents here for the 24-hour Alde wet heating system, which will keep the Rallye cosy if touring all year round. The wardrobe may be on the small side to accommodate a week’s clothing for a family of six, but roof locker space is good and bedding can be easily stashed away in the seat bases. Kitchen storage in the Compass Rallye 636 is excellent, with plentiful lockers above the worktop and the side dinette, and a cupboard and drawers below. There is an additional small dresser by the entrance door, with a cupboard below. Here there is a mains socket and a television aerial point, and it’s the obvious spot for a TV, where it can be comfortably seen by the lounge users. However, Elddis seems to have missed a trick by not fitting a cupboard above this area, which would have added to the 636’s storage. Perhaps the idea was to maintain a sense of space as you enter the caravan by keeping that area free. The 636 layout worked well for 2015’s Elddis Avanté, and in the more upmarket Rallye it should suit a family looking to upgrade. For £25,399 you get great build quality, an excellent specification and modest weight for a twin-axle van. This is a tourer that comes with a luxury feel in a family package.